pinned it. made it. loved it. So I love pinterest. I spend WAY too much time on this site. However I tell myself it’s ok to spend so much time IF I actually make the recipes I pin. Then, it’s more like I spend all this time researching, right? Of course! So I thought I would share some of the recipes that we have tried and loved. Also, I recently joined Weight Watchers. I mentioned that to several friends and I quickly learned 1/2 of the women at Highlands are also doing WW. (slight exaggeration, but only slight) So, I’ll try to share the PP for each recipe also. Keep in mind that whatever brand you use may change the points. Here is a breakfast recipe we have tried and loved. I’ll post more favorite recipes soon! I originally pinned this from Six in the Suburbs however it doesn’t show up on their page anymore. So, I’ll share how I make these now. You could also add cheese. The only reason I didn’t was to save points. Bake 15-20 minutes. At this point you can wrap them up and put them in the freezer. When you want one, put the frozen egg in the microwave for about a minute. Throw your English muffin in the toaster and you have a quick, way better than McDonald’s Egg McMuffin. 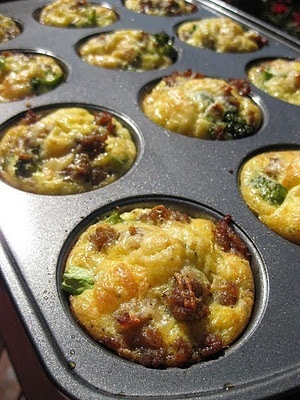 **Before making these, I was pretty worried about the reheating a frozen egg. Sounds pretty sketchy, right? We have made these several times and they taste great.